Do you find yourself freaking out when doing something new and you’re on a deadline? Maybe you snap at your colleagues or your spouse, but you don’t know why? Or maybe, you find yourself at the fridge, snacking on chocolate when you have something important you really should be doing. If you find yourself in these situations, it sounds like you could be suffering from a fairly standard case of overwhelm. Don’t worry, this is completely normal, and luckily for you, I’ve got some wonderful tools to help you in centering your thoughts and getting you back to your high-performing self in no time. 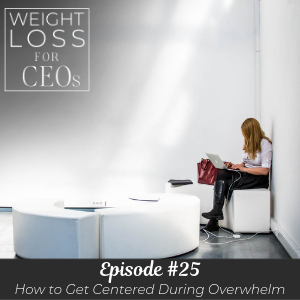 Join me on the podcast this week for some tips on how to identify when you are stuck in overwhelm and how it is affecting your performance potential. It can be hard to spot, but once we identify it, we can work on getting back on the straight and narrow in a self-loving way, without judgment, and preventing it from happening in the future. For a helping hand in overcoming your overwhelm, download my workbook and give yourself the best chance possible of interrupting this feeling. How to spot overwhelm in yourself. Why our big goals, even if they’re what we truly desire, can result in overwhelm. How to interrupt your overwhelm so you can keep pursuing your goals. Why we need to avoid self-judgment around feeling overwhelmed. The importance of asking why when you feel overwhelm coming on. Well, good morning. I hope you are starting off a really good week, and I really do want to encourage you to start getting into the habit of listening to my podcast on Mondays. The reason I chose this production day and drop day, as we call is, was so that it served you during the entire week, and even could be a reminder to go back and listen over the weekend and really apply these concepts. I hope you’re doing that. So, have you been to my website lately? I recently upgraded my website and the reason I did was so that I could also just get really clear and offer you, on that very front page, a new program. So, it all came together this week, and it’s creating a little overwhelm. That’s why I’m doing this podcast today. I think it’s just as much for me as it is for you today. This free training is a powerful series of videos titled How to Lose Your First Five Pounds. Whether you need to lose five and are sick of gaining it back, and you know, that yo-yo effect, or it would be your first five of a larger chunk of weight, this is the program for you. And what do I know? If you can lose five pounds in the way I teach in this series, you can lose five more, five more, or lose that five pounds for good. This is all about losing weight without the diet, without the struggle. It’s peaceful, it’s empowering, it takes some work to apply what I’m teaching you there, but my promise to you is this; that I am in it with you as a coach through email, whatever you need to help you to lose that first five pounds. So join me there at that program. Alright, that is just on my front page. And I want to get into the podcast today because this is really, really important. I’m coming to you this week with a perfect topic. It’s just as much, like I said, for me as I feel like it is for you; overwhelm. I am having one of those weeks. I am going out of town, in fact today, for an amazing VIP retreat that I’m hosting for one of my year-long VIP clients. And therefore, my workweek is shorter on both ends, and even next week. and I’m also doing so many new things. I’m interviewing people for the podcast. That requires new technology. That’s taking a lot longer than I’d planned. And I am offering this new training and finalizing everything on this new website. These are things I’ve been dying to do for a long time, and now that they’re all happening, why am I stressed out and unhappy, right? I set big goals for myself in 2019. My plan is to impact people with my business at four times the value as I did last year. So my goal is financial, to hit four times the revenue. With certainty and belief in these goals, I have created so many beautiful opportunities, and I’m saying yes to so much. Then why, if this is what I really want, am I feeling a little bit overwhelmed? And you might say, stressed, and for today’s purposes, we’re just going to say overwhelm is just a big word for stress. As I look back on my business growth in the past two years, I can see a pattern; growth and shrinking back, growth and shrinking back. You can see it with dollars, you can see it with clients, you can see it with new programs, mostly in what I put out in the world. And why? I think it‘s because growth can create discomfort. But remember, the circumstances of a full calendar, doing new things like this new software that got me tripped up, those are just circumstances. The thoughts I’m having right now are causing me to feel overwhelmed. In today’s episode, we’re going to unpack the why behind the overwhelm so you can understand how normal it is, and to not overreact with even more stressful emotion, and to learn how to interrupt it so you can get back to work. Like many things in your life, you might even be judging yourself for the overwhelm. And that even adds more negative emotion. How do you know that you’re even overwhelmed? What am I talking about? You will see it in your actions. I know, for me, it’s when I want to linger and watch a 45-minute recorded TV show, even though I only allowed myself 15 minutes for lunch. I just watch one more show, right? Or it’s when I find myself at the pantry in the afternoon because my stomach is feeling a little queasy, but I’m not even hungry. Or I start feeling like I’m spinning in my mind and I cannot concentrate on what I have to get done, so it even fuels the reason I was overwhelmed in the first place. We all react differently, but this is what I see as a common reaction to the feeling or emotion of overwhelm; inability to concentrate, kind of feeling that spin, snacking on carbs or candy or anything sugary, procrastinating, being crabby when you’re asked to do something, or just being crabby, nervous stomach, complaining about your day, your task takes much longer than normal, you make snap decisions in the moment that just really aren’t the best for you, or you have a lot of clutter piles on your desk, or on your desktop. And looking at this, overwhelm puts a huge dampener on your productivity. And if we’re not onto ourselves with how we act in those moments, our health, these are the moments when we typically eat when we’re not hungry. This is why the weight loss coach, executive coach, is teaching you this today, because overwhelm is probably one of the main reasons, I know for me that I buffer, that I eat sugary things and eat when I’m not hungry, or I’m drinking to calm down at the end of my day because I’m so worked up. So, is it this way for you? Overwhelm for me is so uncomfortable in my body. Yesterday, I felt it at a very high level most of the day. I feel it tightness, I feel a nauseous stomach. I just feel like I want to run. It’s horrible. I think I dislike the feeling so much that I will just do about anything to feel better. How about you? And that’s what we do. We sometimes don’t realize we’re running from it and don’t know why we’re in the middle of half a piece of cake and we’re like, what happened., I started I diet this morning, I started eating well today, what am I doing? You might just be overly overwhelmed, right? And I want to teach you to do this in your life as well, be able to interrupt it. And I did yesterday. I really got my work done even though I was feeling crummy, alright, and kind of overwhelmed. So, how do you do that? How do you pull yourself back when you’re noticing this emotion? Notice, use the symptoms above as actions to increase your awareness. This is what happens for my weight loss clients. They start noticing because they’re making a new practice of only eating when they’re hungry. Let me repeat that. The reason that their awareness is up or they notice overwhelm and can start identifying it, because they are making a new practice of only eating when they’re hungry. So, when they’ve opened the pantry, and to understand why they’re there, they will need to identify or notice what they’re feeling. And so, the practice of eating to the hunger scale that I teach will actually help you to notice when you’re feeling strong emotions, if you’re an emotional eater, which most of us – we’re human, most of us are emotional eaters. So, this might be a time when you want to have a drink after work, just notice what’s going on. Or it might be – this is another common area, when you just snapped at your spouse or coworker and you feel terrible about it. They really didn’t deserve it. It wasn’t like a fight you were having. You just blew up at them. And let that get your attention curiously, not judgmentally. Be really curious. Let that get your attention instead of judging yourself for being mean or being ugly to your partner. Just pause in that moment and ask why, what am I feeling? So often, snippiness comes from the person feeling overwhelmed and it has nothing to do with the other person they snipped at, right? Okay, so how do we get out of it and get back to work or get back to feeling better so we’re not so snippy? Talk to yourself in a curious and calm manner. Give yourself a break. Like, okay, what’s going on, what’s up? It’s a great question, just what’s up? Why did I say that or what’s going on? And next – this is something I used a lot yesterday, and I had to use it several times by the way because I was really nervous about some new things I was doing. And box breathing – there is a reason that they breathe during yoga. It helps you get into your body and get calm and it calms down your parasympathetic system. So, if you’re noticing that you’re overwhelmed and it’s triggered, instead of just reacting to it, ask yourself why and then just offer box breathing. I love it. It’s in, one, two, three, four, hold your breath, two, three, four, exhale, two, three, four, hold your breath, two, three, four. Just put this on repeat if you need to be taught this again. This is so powerful. This is why I love yoga, getting in my body and reminding myself to breathe. It’s more natural for me. So, box breathe. This literally, biologically, will calm your body down. Sometimes you don’t need to investigate. You need to just get back to work, right? So sometimes, I use this when I’m about to do something that’s causing me overwhelm. So, overwhelm feels fast and agitated, use your box breathing to calm down and just breathe it away. Alright, so some of us, and I know I do this, I self-coach myself a lot, so if I have the time, I’m going to ask why. This is the step of doing your own thought work. And this step isn’t always necessary. Like, yesterday, I did a little bit of work, but I just knew what was up. I was afraid of doing something wrong with the new things I was doing and I was afraid I wasn’t going to get this podcast written. And I did, look at it. Alright, so this is asking why. In a really curious way, ask why and do the work of seeing what your brain is up to, and don’t judge what comes up. This is really important. These thoughts are not you, these thoughts don’t define you, they are just sentences in your mind. And these are some common ones. You’ll understand, if you ask this question, when you see those thoughts, why you’re feeling overwhelmed. It makes more sense. I think it helps us to just go, oh of course I’m feeling that way. But stay curious. This is what I mean. What usually comes up is I don’t have enough time, I’m going to ruin this project, it’s going to be awful, or I’m never going to get this done, my client is going to be so disappointed, this isn’t the work that I want to give them. Like you’re in the middle of something and it’s taking longer and you’re nervous it’s not going well. Any of these thoughts can really contribute to that overwhelm emotion. It’s really common. And investigating takes looking at pattern. Look for the times you commonly, like even journal it if you notice you’re having a lot of nervousness. Notice what triggers your overwhelm. Oh, I always get overwhelmed, for me, when I do something new, when I do something I’ve never done before, I get agitated and nervous and I can’t find my keys, I get flustered. It takes me too much time to do the things that are in front of me. I am squirrel, I am really distracted. I do think I have naturally – I do have ADD – and so getting overwhelmed actually intensifies my ADD. Another trigger might be a pattern every time your kids call and are upset, or if you have teenagers, almost everything is filled with drama, right? And so, this might be a common pattern of when you feel overwhelmed, when they come to you with what’s going on. Or you’ve realized that you’ve forgotten something, you get overwhelmed. Or you’re traveling. And some might call this anxiety. For me, I am afraid that I’m going to be late, so I like show up to the airport like three hours early. It’s crazy. But I know I get a little overwhelmed with packing, trying to make sure everything’s okay at home, and I just get overwhelmed with it all. So I notice that pattern and I go, oh this is what’s going on. Recognizing it as a pattern, for some reason, helps me to just be calmer in those moments, so of course that’s what’s going on, I’ve been triggered. There are times that I just don’t need to do thought work, but if you want to get to the bottom of the pattern and interrupt it sooner and not be experiencing it so often, this is really important; investigate. Always ask why. Get really curious. Alright, one thing that I did yesterday, and I know I do it over and over and I talk about it a lot, but it really is true for me that my life was changed when I read the Practicing Mind by Thomas Sterner. This is learning to drop into the present. And that whole skill, breathing is the beginning of it for me, and then it’s just sinking in. And it’s interesting that I get as nervous in the core of my body as I do calm when I sink into present moment. But it takes practice. This is really meditative. This is a meditative practice. But you don’t have to like meditating. Your brain is busy. Don’t let that throw you off. This is dropping into the present with no judgment. And for me, it’s laser focusing on what I want to get done next. So, yesterday, I was really overwhelmed and I was afraid I was going to forget something. So I took a big sticky note. I have one with lines, and I literally wrote down – and it ended up being two – 10 things that I needed to get done. And I got them all done. But because I wrote them down, I could then stop, drop into the present, and focus on writing the podcast. And within an hour, I had this written. And so that felt really, really good and centering. So, just as overwhelming and awful that being overwhelmed is, like where you’re up and tight in your chest, you can practice just getting focused and centered. And it literally is a practice, without a lot of thought. It’s dropping into the present. So, I think this skill is literally removing procrastination from my routine. I know that I did this yesterday. And I want to remind you, what gets you off from being calm, present, and focused, is judgment. And Thomas Sterner talks in his book all the time that the reason we can’t, we’re not in present moment, is that we’re thinking about the future, thinking about the past, but we’re like in judgment. Judgment interrupts it all the time. Like, I’m not doing it fast enough, or this shouldn’t take this much time, it’s judgment. But if I sink into the activity at hand, I will literally get work done faster. So, truly, any negative thoughts, and certainly the cluster of thoughts that overwhelm is, when we are overwhelmed, it totally disrupts our ability to be present, calm, and focused. But if we practice pulling our attention back to the task at hand, that can immediately calm us down. It’s noticing that the drama of our mind is offering all these thoughts and saying, oh I see you there, but I need to get this done. Yesterday, I literally closed every window on my laptop. I had 17 open, I’m not kidding. That’s clutter. That’s overwhelm. I was afraid of forgetting something, so I left every project open. So I closed everything on my laptop, I closed everything on my desk, and I got to work, and it worked. So, practice building your confidence around this, of moving overwhelm to centeredness, it’s overwhelm to calm. Notice that it’s going on. Oh, I see you there, box-breathe through it, allow the emotions to pass through you while you’re breathing, then act or then get centered and get to work. You know, overwhelm is not really an emotion. It is a feeling that comes from resisting emotion. And that’s why breathing and allowing the emotion can work so powerfully. You don’t always need to know the thoughts that are causing it. You just need to allow the emotion that came from those thoughts, and then they’re gone. If I want to quadruple my goals, I’m going to need to show up four times as powerfully and productively. It doesn’t mean getting busy and rushing, but it does mean following through and completing my work more quickly to make room for more clients, more corporate engagements, more speaking, more podcasts, whatever it is. Whatever is going on for you, I hope that you have seen and recognize that there are some areas that you get overwhelmed, and that now, you have the tools to calm down and get back to business, or just calm down so you feel better. Feeling better is always my goal because when I feel uncomfortable, I don’t treat my body very well. I might even workout too hard because I’m so jazzed up, right? I know that, in the past, I was using this when I was building my business as a very new business owner. I was running hard all the time and not really recuperating properly. I’d much rather mix this in with some really good thought work or awareness and new pattern. Remember, notice that it’s going on, notice that you’re overwhelmed, breathe through it, allow the emotions to pass, act or get laser focused and get to work. I have created a really quick worksheet for this. If you share your email for this, it is in the show notes, you will get the worksheet. And this just can serve you to practice this two or three times. Once I understood the concept of dropping into the present, this is something that I can do really, really effectively, and it did not take me very long. I know it won’t take you very long. Alright, so I loved sharing this with you today. Don’t keep this podcast a secret. Please share it with others. Share it on your Facebook page, share it on Instagram, and thanks again so much for being a listener, and I’ll see you next week.